Dan Yaccarino's great-grandfather arrived at Ellis Island with a small shovel and his parents' good advice: "Work hard, but remember to enjoy life, and never forget your family." 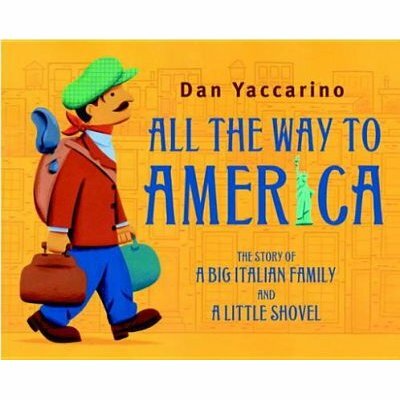 With simple text and warm, colorful illustrations, Yaccarino recounts how the little shovel was passed down through four generations of this Italian-American family--along with the good advice. It's a story that will have kids asking their parents and grandparents: Where did "we" come from? How did our family make the journey all the way to America? "A shovel is just a shovel, but in Dan Yaccarino's hands it becomes a way to dig deep into the past and honor all those who helped make us who we are." --Eric Rohmann, winner of the Caldecott Medal for "My Friend Rabbit"
""All the Way to America" is a charmer. Yaccarino's heartwarming story rings clearly with truth, good cheer, and love." --Tomie dePaola, winner of a Caldecott Honor Award for "Strega Nona"